When late in the blustery evening of 26 October President Sirisena swore in Mahinda Rajapaksa as Prime Minister, he set in motion a constitutional crisis of an unprecedented intensity. To say it was a surprise move is an understatement. There was a sitting Prime Minister; the President offered no public explanation, prior or even immediately after, for his drastic move. 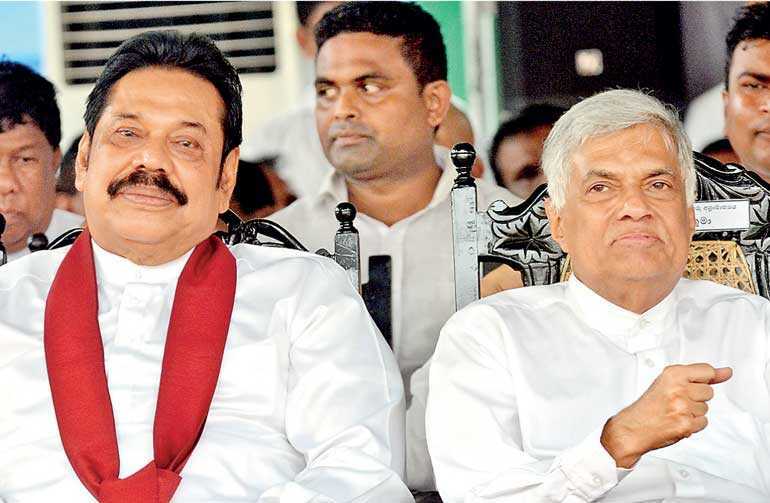 A few days later, the President went on air explaining the difficulties of working harmoniously with the incumbent Ranil Wickremesinghe, pointing to a series of alleged acts of commission and omission. He adverted to several instances of corruption, implying collusion/collaboration therein. The President highlighted an alleged assassination plot targeting him, towards which investigation the attitude of the Prime Minister and his administration was indifferent, in his assessment. The incumbent did not throw in the towel, claiming the allegiance of a majority of members of Parliament, Ranil Wickremesinghe continues to occupy Temple Trees, the sprawling colonial era bungalow, the official residence of the Prime Minister, while Rajapaksa, the newly-sworn-in Prime Minister, took charge of the Prime Minister’s office along Flower Road. Meanwhile the security detail (said to be more than 1,000), the staff and perhaps the vehicles allocated to Wickremesinghe have been reduced considerably. Temple Trees, like all institutions adopted from the European political models/practices, came with a new way of life and thought. We embraced end products (ideas and institutions) without the organic cultural development which engendered them. The White House or No. 10 Downing Street may have a particular symbolic meaning in the creating culture, but here in the adopting culture, only a mimic; embarrassingly contrived, confounding a massive confusion. When Mahinda Rajapaksa was President, he not only occupied the President’s House but also Temple Trees. Where D.M. Jayaratne, his Prime Minister, lived is unknown, even immaterial in the context of the exercise of power in that era. It is also well known that Prime Minister Wickremesinghe only used Temple Trees for ‘official’ purposes, as an extended office, preferring to live in his private residence. Through the years Temple Trees has become a centre of political activities of various prime ministers/presidents, distinct from public duties, used for party meetings and even private functions like weddings. Predictably, the actions of the President divided the nation; supporters claiming that the process followed was a legitimate exercise of Presidential powers while his opponents damn it as unconstitutional and bad in spirit. According to our Constitution, interpreting constitutional issues is a responsibility of the Supreme Court. Neither party has referred the matter to the Courts, thus leaving it open for the humble citizen to give his own interpretation to the dramatic events happening at the centres of power. The 1978 Constitution was a fundamental departure from the Westminster model we had followed from 1948. Prior to 1978 the President was only a constitutional head, acting on the advice of the Prime Minister, who was responsible to the Parliament. With the 1978 Constitution we ventured in to uncharted territory, a hybrid presidential system (a hotchpotch, copying from both American and French models), embracing the concept of an elected president with executive powers, but with certain differences with the countries cited. We don’t have a vice president like in the US, while our Cabinet is exclusively from the Legislature, for example. As the Head of the Executive, the President appoints the Cabinet, Ministry Secretaries and presides at Cabinet meetings. It is the President who appoints the Prime Minister; the member who in his opinion commands the confidence of the Parliament. There is no requirement to take a poll in the Parliament to determine the numbers. In the reverse situation, if in the opinion of the President, the person so appointed has lost the confidence of the Parliament, can he remove him? The legislative processes must continue, the Executive must function. In the scheme of the 1978 Constitution (and the amendments), with a stalemate between the executive President and the Legislature as at present, it is near impossible for there to be any governance to speak of. The ongoing crisis has also resurrected a common spectre of our politics, back-door dealings; fickle men, the faithlessness of our legislators when it comes to party allegiances and their clear lack of ideology. The very men who in 2010 subserviently endorsed the 18th Amendment to the Constitution, which sought to enhance the already formidable powers of the President, just five years later in 2015 self-righteously voting in the 19th Amendment purporting to curb the scope of presidential power. There is provision in the 1978 Constitution to forfeit the membership of a parliamentarian failing to adhere to his party line. A person is elected on the basis of a party programme (manifesto). If he defies the party whip or crosses over to another party, he betrays his voter. In legislative processes there could be occasions when a member may feel obliged to go against party discipline on the basis of his conscience or in the national interest. The ideal remedy would have been to require him to face a by-election in the respective electorate to renew his mandate. But that is not possible under the district wise list system which came with the Constitution. In reality, nevertheless, even the requirement to remain faithful to his party has no meaning, judicial interpretations have made the automatic forfeiture of membership upon breach of party line, a dead letter. Unlike Moses’ commandments, our laws do not come down from heaven. Boosted by his unprecedented 1977 electoral triumph to a ‘philosopher king’ status, J.R. Jayewardene pronounced that the country needed a presidential system, which he opined would be less subject to legislative instability. In fact, the result was the reverse, Sri Lanka entered its most turbulent period since independence soon after. In terms of economic growth, the Constitution does not seem to have mattered at all, countries that did not tinker with their constitutions have progressed at a much faster pace. At a recent seminar a participant argued that the war against terrorism was won only because of our presidential system. On a global scale our so-called war, a conflict between two sets of people born in this country, was a mere bush war; intermittent, dragging on only because neither party was strong enough to deliver a decisive blow. The unsuitability of the presidential system is borne out by the introduction of the 19th Amendment, an effort primarily by a UNP-led government to curb presidential power; a concept which in the first place was their (J.R. Jayewardene) brainchild. It is amazing that while nearly all parties decry the Constitution, and at various times have suffered at its hands, none have moved to jettison it altogether. As long as individual leaders could dream of exercising presidential powers someday, they were willing to let it run. Another controversial aspect of the 1978 Constitution is the idea of proportional representation. As a concept there is merit in a system which allows minority representation in proportion to their numbers. But in a horse trading political culture, small parties acquire a bargaining power far above their actual numbers. It cannot be said that proportional representation has alleviated the lot of the minority groups. Their leaders on the other hand, have been empowered totally out of proportion, opening up opportunities for personal enrichment in every way, including unbroken stays as ministers. There are no permanent friends or enemies for them, only permanent interests. It is impossible to imagine that they have a mandate for the political gyrations they perform once elected. A plethora of small political parties have also led to the emphasising of differences in the community rather than of fostering a long-term national identity. Concomitant with proportional representation, a district wise list system of voting was introduced. This method of voting, while advantageous to the “big names”, encourages patronage and corruption on a wide scale. The party leaders become all powerful, undermining democratic instincts in the particular party, an effect which finds expression in the wider society eventually. A major party can ensure the election of an undeserving person by merely placing him strategically on a list. The system also allows for list MPs who don’t face any election. Sometimes these ‘unelected’ MPs end up dominating the Legislature as well as the financial management of the country, a fundamental violation of the principle of accountability to the voter. If the 1978 Constitution has led to the abuse of power, social corruption and moral decay, amendments thereto have only worsened the situation by their piecemeal and incomplete nature. Before the whole country now stands the fragmentary nature of the 19th Amendment. In a potentially explosive situation such as today, an effective way of releasing the deadlock would be to let the people speak, by way of a general election. The amendment appears to be standing in the way here. Laws must be clear and functional. What applies to the primary law, the Constitution, is true many times over with other laws created by the self-same legislators. A tax consultant told me that our Inland Revenue Act has had so many amendments, and amendments to those amendments, that it makes no sense to look at it for guidance. The only way to get results with the Tax Department is to negotiate with officers there, a path susceptible to abuse; favouring the powerful, leading to corruption. Only the restoration of a parliamentary system, as we had before 1978, with requisite adjustments suggested by our constitutional experiences since, can bring stability and sanity to the muddled scheme prevailing. There is a fear that an unsuitable Constitution has corrupted the nation’s overall moral fibre as well as democratic instincts to such an extent, that even a new constitution may not be able to restore confidence in the legal framework fully. It needs the support of other laws with similar direction. Among ideas suggested are the strengthening of the right to information, the expansion of Ombudsman functions and laws to effectively investigate unexplained asset betterment. From our experiences in electoral politics it has become apparent that there cannot be a true democratic process until the political parties that come to power through that process are also democratic institutions in every sense. Most of our political parties function like semi-feudal societies with the leader being all powerful. There is a compelling case to insist on greater transparency, truly democratic constitutions as well as laws that open up and control political funding vis-à-vis our registered political parties. Never has the warning “among a people generally corrupt, liberty cannot long exist” rung as urgently as now.